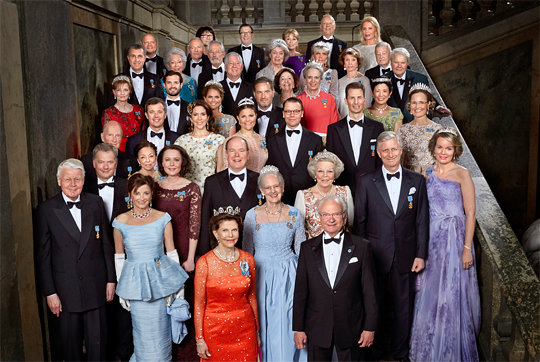 The festivities in Sweden this weekend wrapped up with a black-tie gala in honor of the king's birthday. Even though this event wasn't white-tie, we were lucky: most of the royal women still wore tiaras! Here's a look at the jewels on display. 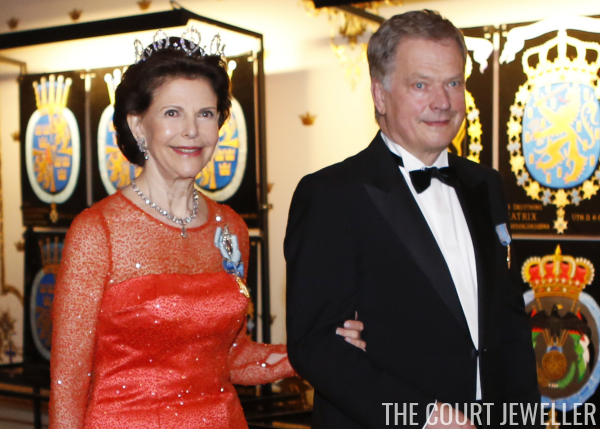 Queen Silvia wore the Connaught Diamond Tiara, which was a favorite of the king's late mother, Princess Sibylla. The Boucheron Laurel Wreath Tiara, worn by Crown Princess Victoria, originally belonged to Margaret of Connaught but is best known as the tiara worn by the late Princess Lilian. She bequeathed the tiara to Victoria in her will. Princess Madeleine wore her wedding tiara -- the convertible modern diamond fringe -- to the gala, plus a pair of earrings from the Bernadotte collection. Many believe (and I agree) that the earrings are probably a converted pair of diamond epaulettes, which would have been worn at the shoulders of a dress military uniform. All four of the king's sisters were present, and all of them wore tiaras. 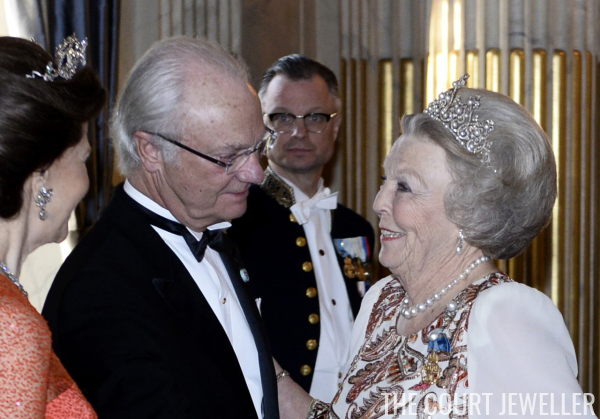 Princess Birgitta borrowed the Baden Fringe Tiara from the family's foundation. Princess Desiree wore a tiara that belongs personally to her: Queen Louise's Diamond Tiara. Queen Margrethe II of Denmark chose Swedish heirloom jewels inherited from her mother, who was born a Swedish princess. The Baden Palmette Tiara once belonged to Queen Victoria of Sweden. 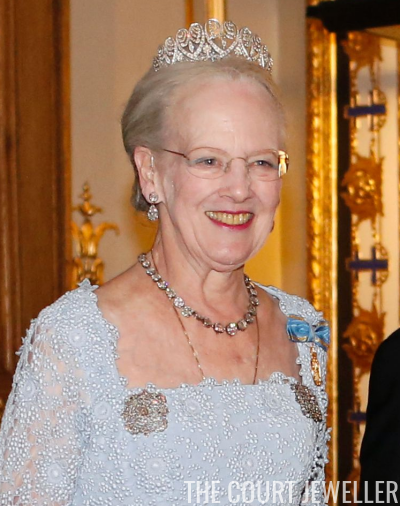 The square diamond brooches that Margrethe wears at the neckline of her gown once belonged to Queen Josefina of Sweden; they were originally meant to be worn at the shoulder, and Bjarne Steen Jensen estimates that they were made between 1840-50. Josefina bequeathed them to her granddaughter, Queen Lovisa of Denmark, and they've been in the Danish royal collection ever since. Princess Benedikte also wore Swedish jewels, donning Queen Sofia's Star and Pearl Tiara, plus diamond stars that came from the collection of Queen Victoria of Sweden. She also wore diamond bracelets that are Danish heirlooms; both are part of Queen Alexandrine's diamond sautoir. Crown Princess Mary, sadly, went tiara-less; instead, she wore a hair ornament and matching earrings by Ole Lynggaard. Princess Martha Louise of Norway wore a tiara that belongs to her personally: King Olav's Gift Tiara, which (as the name suggests) was given to her by her grandfather, King Olav, as an 18th birthday present. Queen Mathilde of the Belgians wore the tiniest tiara in her collection: the convertible Wolfers Tiara, which she inherited from the late Queen Fabiola. Princess Beatrix of the Netherlands wore one of her go-to tiaras: the Wurttemberg Ornate Pearl Tiara, which she wore on her wedding day. 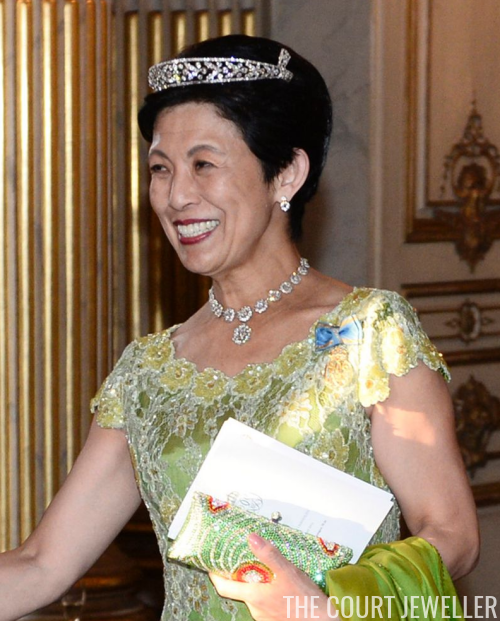 Japan's Princess Takamado wore her diamond bandeau with a laurel-wreath design with a glittering necklace and earrings. Margarita of Romania wore the family's Greek Key Tiara, which began its life as a kokoshnik in the collection of Grand Duchess Viktoria Feodorovna of Russia. Kelly of Saxe-Coburg and Gotha, part of the king's maternal family, wore the family's elaborate diamond and turquoise parure. The Bavarians have recently sold many of their grand jewels. Ursula of Bavaria wore the same small diamond scroll tiara that she donned at Prince Carl Philip's wedding last year. There were a few more tiaras worn, but I don't have individual images available to share. Princess Margaretha wore the aquamarine kokoshnik, which is also owned by her personally. And Princess Christina selected the tiny aquamarine and diamond bandeau, which is most associated now with Princess Madeleine but was worn by several of the Haga princesses in their younger years. Hereditary Princess Sophie of Liechtenstein wore one of the grandest diamond fringe tiaras in Europe: the family's Habsburg Fringe Tiara. And Katherine of Serbia wore a small diamond tiara. You can see glimpses of all of them in the group photo at the top of the post.